Our Patrick finally dusts off the Dura Ace from his velvet-lined treasure chest of old bike bits. When I started getting into cycling seriously in the late ‘80s every waking moment outside of school was taking up with cycling. This wasn’t just riding but wanting to learn all about it; the kit, riders, races and history. Every magazine I could get my hands on (pre internet days – you youngsters don’t know how lucky you are these days!) was read and re-read countless times and pictures scrutinised in military intelligence level detail. Campagnolo Record and Shimano Dura Ace were the professional’s choice of groupsets and all the pics of the top racers and races showed this equipment being used. Being ‘new school’ myself and unable to afford or easily get my hands on Campag – my local bike shop didn’t stock it – led me to use Shimano. 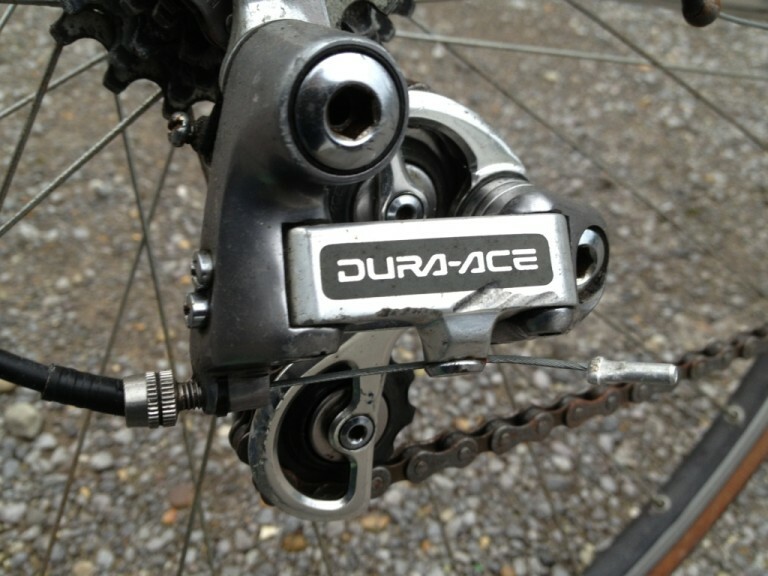 Dura Ace – 7400 series in particular at that time – therefore appealed to me more. I studied it for familiarities to the lower groupset I was using and again discussed it all with friends. The high price meant it was out of reach for me. When I did see it on bikes in real life I was mesmerised by it. Two items in particular always stood out for me; brake levers and the rear mech. Chainsets, brakes and gear levers never stood out as much. Even to this day my eye is automatically drawn to handlebar levers and rear mechs when I look at bikes. 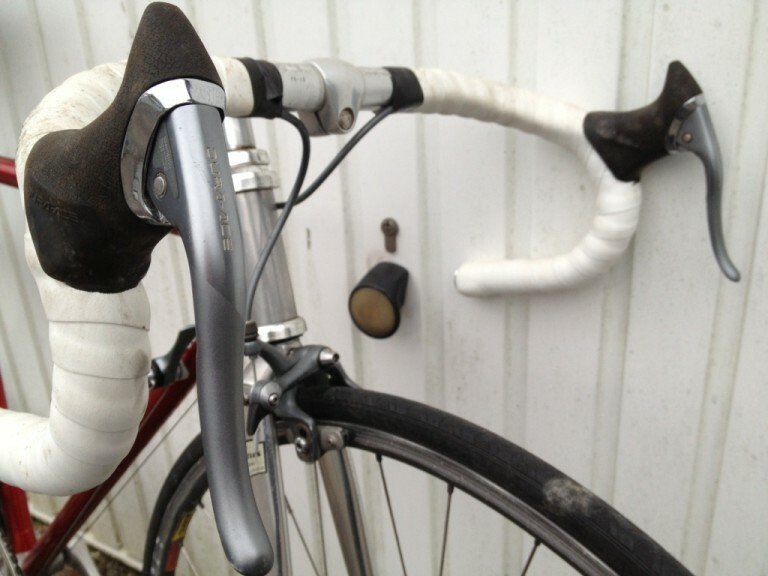 These are the brake levers I would have given a kidney for when I started out. In my opinion they’re still the best looking Shimano aero brake levers ever. Sure, they have been superseded by much more practical STI levers and there’s always the timeless elegance of Campag aero levers but these ones are my out and out favourite. I had always promised myself I would get a pair one day and a few years ago this set were in a shop counter being sold for a member of staff for the price of a drink so… they became mine. They are now on a similar period set of Cinelli bars and although the shape feels odd compared to modern levers I still love the slim design and smooth action. For sheer class and looks they can’t be beaten in my eyes. From the side, the rear mech is usually the first component my eyes are drawn to when looking at bikes. This is probably the least subtle branded Dura Ace rear mech Shimano have ever produced and I love the boldness of it. All Shimano road groups at the time had the name of the groupset on them in very big letters, just like the current models but less subtle, so there really was no mistaking which one you were using. Only the top boys had this one and I remember looking at them reverently when studying kit in pictures or actually seeing one in real life. This one was picked up from a bike jumble a couple of years ago and still fetched a relatively high price compared to more modern Dura Ace versions for sale there. The changes are still crisp today and it runs through all 7 gears with perfect clicks. Remember when we thought 14 gears in total (all indexed too) was the latest and best thing ever and you didn’t even dream you would ever need any more gears than that? Tagged clutter, dura ace, parts bin, retro, retrobike, Shimano, vintage. Bookmark the permalink. The reason for the relatively high price of the Dura Ace 7400 rear mech, is that the 7400 series indexed shift levers are not compatible with the more modern Dura Ace rear mechs. The 7400 series was released in 1984 and stayed the top of the line until the release of the 7700 system in 1997 which converted the cable pull ratio to the one used by the 600 series making the Dura Ace parts interchangeable with the rest of the Shimano line. 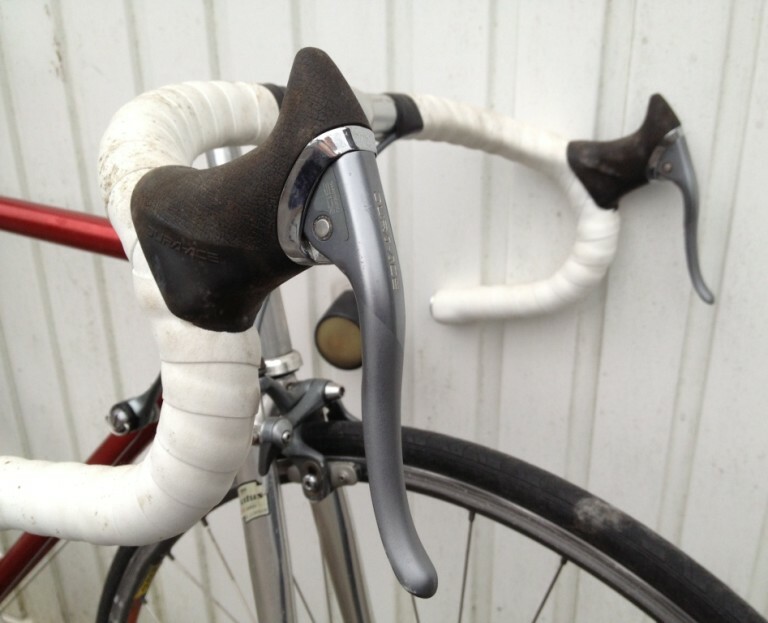 The 7400 brake levers have the same shape as the 6400 (the 600 Ultegra group) but have chrome instead of muted gray where the lever enters the body. Sort of a flashy vs understated elegance question that becomes a matter of personal taste.